The following information relates only to sessions and lectures held in the rooms and lecture halls of the International Congress Centrum (ICC Berlin) and Messe Berlin. A central Media Check will be available in Room 44 (ICC Berlin) for the duration of the congress. All projection data for presentation (lectures, oral presentations, etc.) will be collected, administered and held on a central server during the entire congress. Administration, technical preparation and care of all digital presentations will be solely undertaken by M Events Cross Media GmbH. Speakers will be able to call up their presentations directly at the lectern during each session and the projection of data will only be possible using the beamer provided. In order to maintain the international character of the congress and to enable all delegates to understand and participate in all presentations in an optimal manner, PowerPoint presentations and lectures in the main SOE & DOG part of the congress should be prepared in English. All lectures held in the Main Lecture Hall (Hall 3) will be simultaneously translated from English into German. Lectures in the DOG part of the congress should be held in German. Double beamer projection will be available for these DOG sessions; PowerPoint presentations should therefore be prepared in a dual language manner, German and English, for simultaneous projection. In order to ensure the smooth running of the event, all speakers are requested to submit their presentations in Microsoft PowerPoint file format (earliest acceptable version, Version 8 - Microsoft PowerPoint 97 or higher). Graphic data should be embedded into presentations and video and audio data must be linked to presentations and should be added separately as *.avi, *.mov or *.mpg file. 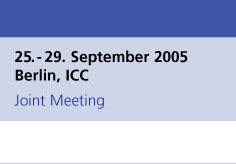 All presentations should be submitted to http://soe2005.m-congress.com between 10.08.2005 and 16.09.2005. Therefore authors will receive a separate e-mail from M Events Cross Media GmbH with access information and instruction regarding formats and codecs. PowerPoint presentations and all integrated graphics, audio and video data will be uploaded directly onto the congress server. Any technical questions may be e-mailed to soe2005@m-congress.com. Speakers will also have the opportunity to submit their presentations on site in the central Media Check. This should be carried out as soon as possible, but not later than three hours prior to the session where it is due to be presented. IT personnel will then upload the data onto the central server for the duration of the congress. Presentations which have already been submitted can be viewed and amended up to three hours prior to the start of the session where it is due to be presented. MS Windows compatible CD-Rom (ISO 9660). ZIP disk (ZIP 100 or ZIP 250). USB bulk memory stick (with drive where applicable). The electronic information system in the halls and foyers of the ICC which provides all the presentations and details on the scientific programme is a closed system and will not facilitate the connection of a laptop. Therefore, facilities for the use of private laptops for presentation will not be provided. Finally, we ask for your understanding that slide and overhead projection facilities will only be provided in exceptional circumstances. Speakers who require either of these two facilities should contact Porstmann Kongresse GmbH not later than 1 September 2005. Please note: All stored data will be deleted irrevocably shortly after the meeting.